(HARLINGEN) – La Feria High School graduates and best friends Juan Buenrostro, 18, and Richard Alfaro, 19, recently completed the Texas State Technical College Auto Collision Technology Pathway through TSTC’s Dual Enrollment program and were the first ever to be recognized for this achievement. His best friend shared the same sentiment. 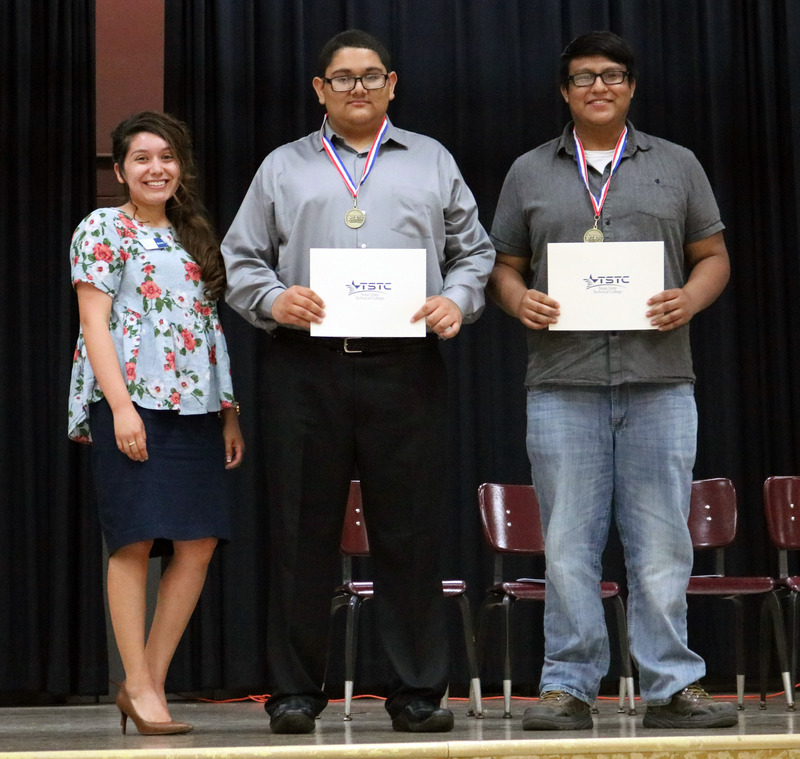 Both men, who completed the career pathway – a series of courses toward a program degree – while still high school seniors, were awarded a certificate and medallion at their high school’s fifth annual La Feria Certification Celebration Night. TSTC Dual Enrollment Advisor Sarai Duran said the pathways are a recent initiative and have only been in the works for the past couple of years, but the dual enrollment program, in which high school students complete college courses and receive credit, has been in place for several years. Students can choose from 13 pathways to enroll in and complete ranging from Wind Energy Technology and Business Management Technology to Culinary Arts, Machining and Welding; and four online pathways: Medical Office Specialist, Computer Aided Drafting and Design Technology, Digital Media Design and Cyber Security. TSTC is partnered with school districts from across the Rio Grande Valley, serving students from Cameron, Hidalgo and Willacy counties. In fact this last school year, 15 students from San Benito Consolidated Independent School District completed the Education and Training Pathway, while four students from the Pharr, San Juan and Alamo Independent School district completed the Agricultural Technology pathway and four more students from the McAllen Independent School District completed Auto Collision Technology. School districts like La Feria, cover the program cost, supplies and books. The classes are free for students. “By completing a dual enrollment pathway, students and their families not only save time, but also money,” said Duran. Each pathway is worth 12-14 credit hours, allowing a student to complete one semester of college even before graduating from high school. Buenrostro and Alfaro are already planning to return to TSTC Fall 2018. Buenrostro plans on enrolling in Auto Collision Technology to pursue an associate degree, while Alfaro plans on registering to earn a certificate in auto collision and an associate degree in Welding. For more information on TSTC’s Dual Enrollment Pathways and the programs offered, call 956-364-4165.